Kashmir hasn't yet produced enough literature about its conflict, especially for outside audiences. Kashmiris, we are often reminded, have relied more on outsiders to narrate their ordeal. Now, though, Kashmiris have started to tell their own stories, of tragedies and triumphs, through memoirs, prison diaries, novels, poetry. The trend is partly fuelled by a desire to deconstruct the perceived distortion in the outsiders' narratives on Kashmir. Among the new breed of storytellers are many women, whose voices have greatly diversified the "resistance literature". Rightly so, since women have suffered immensely in the bloody conflict, largely in silence. The former BBC journalist's Dehshat Zadi - roughly translated as Frightened Daughter - is one woman's eyewitness account of violence against women in the early 1990s. "Well, you can say that Dehshat Zadi is my own eyewitness account of the socio-political situation of the early 1990s. The main focus of my story is the Kashmiri woman who was hardly taken on board when the armed rebellion broke out in Kashmir," Mahjoor says. "That is, however, not to say that they did not support the movement. But whether taking to arms was the only available option at that time is debatable. She found herself sandwiched between the violence perpetrated by the state and non-state actors." Mahjoor, who moved to London after joining the BBC in 1993, adds, "How the world looked at the Kashmir conflict was an eye opener. For the outside world, our dead were mere statistics or body bags. But for me, they were real people with real stories." Mahjoor's book is in Urdu and she expects the English translation to come out by August 2016. After retiring as a broadcaster a few years ago, Mahjoor returned to Kashmir and joined the PDP. Her decision wasn't received well by people in the valley, who had long known her as the distinctive voice of BBC Urdu's popular news programme "Sheharbeen". She currently heads the State Women's Commission. 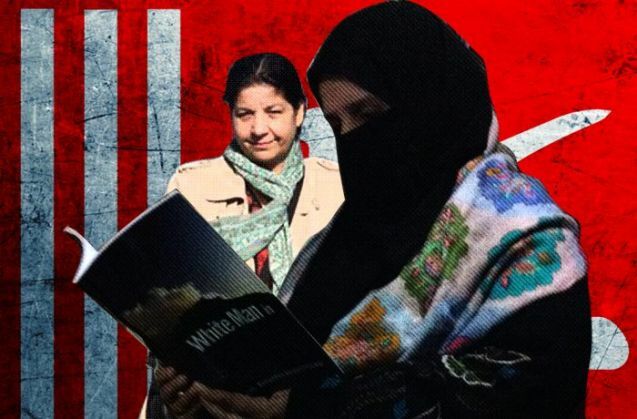 A senior pathologist based in Srinagar, Makhdoomi released her memoir White Man in Dark early last year. What's the book about? "I have lived the conflict. I wanted to narrate the story from the perspective of a woman born in this Kashmir," she says. "And I wanted to contribute to the resistance literature." There is "undocumented pain" in her memoir, she adds. The main protagonists of her story are Kashmir's doctors. "I wanted to acknowledge the pain and suffering of our doctors whose outstanding work often goes unnoticed and unacknowledged. They have done tremendous work during the conflict," she says, describing the men in white as Kashmir's "unsung heroes". "As a doctor, I have seen suffering closely. This loss of life, this destruction has shattered generations. We have been living in extreme fear and trembling of our fellow human beings," she writes. "We had no control over what was happening. No comment was advised, no criticism allowed - life was more precious! Who was supposed to protect our assets? This query would seem unnecessary in a place where the basic question 'who is supposed to protect our lives?' could not be asked." But for someone who witnessed first hand the horrors of the violence, Makhdoomi says, it was "difficult" to write about her personal pain. The second of her three daughters was born with a cleft lip and palate. The condition, however, was successfully corrected by Dr Shabir Iqbal whom she describes in the book as "my Kashmiri hero". The separatist leader released her prison memoir Qaidi No. 100: Bharati Zinda'an Main Mere Shab-o-Roz (Prisoner No. 100: The Story of my Ordeal in an Indian Prison) in 2009. Habib was arrested in February 2003 for allegedly funding the local militant group Hizb-ul-Mujahideen and incarcerated in Delhi's Tihar jail for nearly five years. She was lodged in Ward 2 of Jail 6 and listed as Qaidi No. 100. Habib insists that she was framed and the charges against her were baseless. Of her prison days, she tells Catch: "Everyone from the jail officials and inmates to judges and lawyers was hostile to me because I was a Kashmiri prisoner. To them I was a khoonkhwar aatankwadi [bloodthirsty terrorist]." "They would often taunt me by saying 'tera rang to gora hai, magar dil kala hai [you are fair but your heart is black]'." Her life inside Tihar, she says, was "hell". Alleging ill-treatment at the hands of the Delhi police, she writes, "They told me you are a separatist leader. We will just strip you naked, take your photos and distribute them all over India." Habib was released in December 2007 but, she says, that didn't free her from pain. "I couldn't sleep. I was haunted by the images of prison bars, the torture and the atmosphere of constant fear." Habib now leads Muslim Khawateen Markaz, a constituent of the Hurriyat Conference. She, however, has been involved with the "Azadi movement" since the armed struggle began in the late 1980s. Originally from south Kashmir's Anantnag, Habib is a postgraduate in Education and has studied law as well. "I am not a professional writer though. But I wanted to write about my ordeal, so I did," she says. Habib believes that no "cause can ever succeed if women are not consulted". "The whole world is male-dominated. Kashmir is no exception. I believe no movement will ever be successful if women are not involved in the decision making process," she says. She believes that woman have "suffered and sacrificed the most in Kashmir's struggle for right for self-determination". "A woman lost her son. A woman lost her husband. A woman lost her brother. A woman cooked food, washed and provided shelter," she says. "A woman resisted and was the first to hurl a kangri (earthen fire pot) at the Indian soldiers during a crackdown in south Kashmir in the early 1990s as a mark of protest against the oppression." Among the new writers are members of the Kashmiri diaspora as well. Kaul is a novelist and academic based in London. Her debut novel Residue was shortlisted for the 'Man Asian Literary Prize' in 2009. The riveting novel explores the dynamics of a class-stratified urban India, and a search for identity in a multi-cultural Britain. It is a story about Leon Ali, a Kashmiri born in Britain, and Keya Raina, a Kashmiri scholar in exile. They meet in Berlin and grow close, only to find disquieting truths about themselves, "the residue of shared emotions". Hopefully, Mahjoor, Makhdoomi, Habib, Kaul will inspire more Kashmiri women to tell their stories. Gowhar Geelani is a journalist, commentator and political analyst from Srinagar. He was formerly with Deutsche Welle, Germany.